A new report underlines the basic problem with the post-Great Recession American economy: the rich are getting richer while everyone else is falling further behind. The study by the Pew Research Center finds that the average net worth of the top 7 percent of the U.S. population increased 28 percent in the first two years of the recovery. The wealth of the other 93 percent declined. From 2009 to 2011, the average net worth of the richest 8 million households jumped from an estimated $2.7 million to $3.2 million, according to The Washington Post report on the Pew study. For the 111 million households that make up the bottom 93 percent, average net worth fell 4 percent, from $140,000 to an estimated $134,000. Sadly, this is not a recent phenomenon. The divide between the rich and the poor has been yawning progressively – or should we say, regressively – since the early 1970s. A study last September by the Economic Policy Institute (EPI) in Washington noted that the median annual earnings of a full-time, male worker in the United States in 2011, at $48,202, were smaller than in 1973. Between 1983 and 2010, 74 percent of the gains in wealth in the United States went to the richest 5 percent, while the bottom 60 percent suffered a decline, the EPI calculated. Any way you figure it, the middle class is getting screwed. Award tax cuts to companies that link the pay of their hourly workers to profits and productivity, and that keep the total pay of their top 5 executives within 20 times the pay of their median worker. And impose higher taxes on companies that don’t. Raise the minimum wage to half the average wage. Increase public investment in education, including early-childhood — especially in the poor and middle-class communities that now lack decent schools. Eliminate college loans and allow all students to repay the cost of their higher education with a 10 percent surcharge on the first 10 years of income from full-time employment. Add tax brackets at the top of the income tax scale, increasing the top marginal tax rate to what it was before 1981 – at least 70 percent. 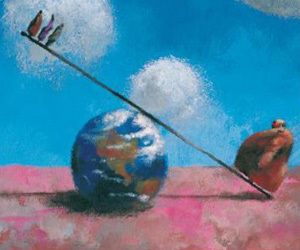 It should be simple math: the 99 percent should prevail against the 1 percent in a democracy, right? But our democracy is skewed by big money; corporations have bought politicians for years, with few fingerprints. Not just the inside-game glad-handing and lobbying, but also with well-funded public relations campaigns, trying to shape the message to hide the greedy corporate agenda. The Koch brothers, authors of much of the disinformation during the last election cycles, reportedly now may buy the Tribune Company to help push their right-wing agenda – adding to the noise of Rupert Murdoch’s Faux News and Wall Street Journal editorial page. While we fight this uphill battle against the anti-democratic forces that grease the palms of too many political leaders in the United States today, we can be cheered by an ongoing global campaign to rectify the inequality through a “Robin Hood Tax,” a levy on transactions of stocks, bonds and derivatives first proposed by the National Nurses Union and their international allies. With 1,000 demonstrators calling for reform in the streets outside the International Monetary Fund meeting in Washington last weekend, finance ministers from the EU were reporting on their negotiations to impose a financial transaction tax. The proposal: a tiny 0.1 percent tax on stock and bond trades and 0.01 percent tax on derivatives trades. The return would be an estimated $750 million to $1 billion over 10 years to plow back into their economies and create jobs through public works and other stimulus programs. 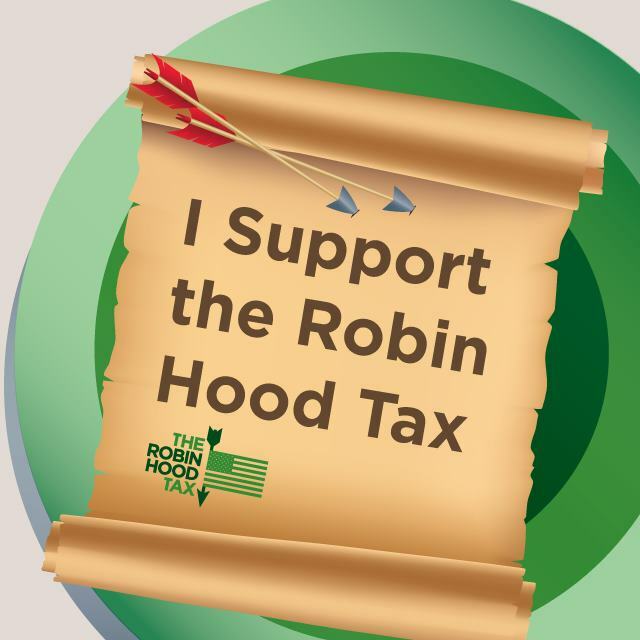 A Robin Hood Tax on transactions would be a small price to pay by the global financial giants that created the Great Recession in the first place with their risky speculation schemes. But it’s just a beginning. Perhaps we cannot resurrect Robin and his merry men to shake up the power brokers in Washington, where money rules most ignominiously. But we can recreate the spirit of appropriating from the greedy, of which there are many nowadays. Let’s insist on policies and reforms that close the great divide between the rich and the rest of us. This entry was posted in Uncategorized and tagged Faux News, Great Recession, income inequality, Koch brothers, middle class, National Nurses Union, pew research center, rich get richer, Robert Reich, robin hood tax, tax the rich by bymichael2012. Bookmark the permalink. and let’s not forget … the income figures you cite mask the fact that women have it worse, making an average 77 cents on the dollar for every working man.